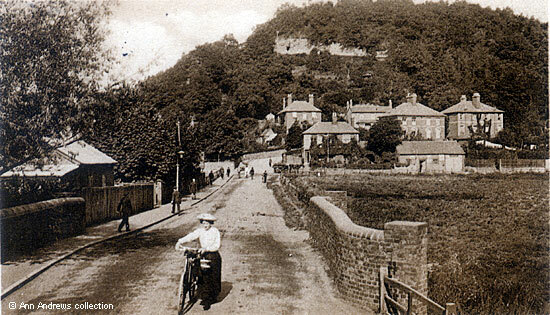 This postcard of Borough Road, Deanery Road and Frith Hill was published in both colour and sepia versions. It is interesting to compare the picture with one which dates from 1900 in Mr. Janaway's book about Godalming. On the left, just beyond the bridge over Hell Ditch, is a house that wasn't in the earlier picture and the trees grew considerably in the intervening years. Look carefully and you can just see a horse and cart outside the Charterhouse Arms on the corner of Deanery Road and Chalk Road. In 1913 Harry George Mayne was the licensed victualler. He was still there in 1939. Enlargement showing the Charterhouse Arms and some of the houses on Deanery Road. There is a house on the right of the pub, with a man standing in the doorway. This property was still there in 1934 (Ordnance Survey County Series Map of Surrey 1:10560). The horse, with its cart, is waiting patiently. Bottom left is probably a local postman with his push bike. Cycling was a popular pastime and before the first war Godalming and Farncombe were awash with cycle dealers and agents. In Godalming Ernest Arthur Edgington was in business on Bridge Street, Frederick Scott was at 85 High Street and Mrs. Edith Rutherford had premises at both 15a High Street and 33 Bridge Street. In Farncombe were James Harlock, who was a dealer at 4 St. John's Street, Edward Hinder at 21 Summers Road and the Weale Brothers at 48 Meadrow. As well as the lady in the foreground there are four other cyclists using the road - seen closer to the junction. Crossing the road close to the lamp post is another of the local postmen. We are fortunate to know the lady cyclist's identity and what she was doing as she often related the story of how she came to be photographed to her children. Rose Lily Little was born on 11 February 1895 and had moved to Godalming to work for the "The Singer Sewing Machine Company". One day in the summer of 1914, just before the First World War broke out, she had been asked to deliver a sewing machine to a property near Frith Hill; the machine was balanced on the back of her bicycle. It was on the return journey that the photographer stopped her and asked if she would mind being in his picture. Rose went on to marry Wilfred Thomas Warner at Busbridge Church in 1917. Cycling was clearly good for her as she lived to be 101 years old. The card was sent from Daisy lodging at a house on Croft Road on 26 Jan 1915 to Mrs. Barrett in Sherborne and part of message reads, "I have got very nice lodgings (Army people). This is ever such a pretty place. I wish you were coming for a time we had nice meetings yesterday it is a nice corps. I saw A. there was plenty of soldiers in". 1. and 2. "Frith Hill, Godalming". Valentine's Series Card. "Kelly's Directory of Surrey" (1913) Kelly & Co. Ltd, London. The 1939 Register, available on Find My Pat, shows Harry Mayne with Ethel, Roger and John also living at the pub. Although it is some years later than the picture was taken "Kelly's Directory of Surrey", (1924) lists the Singer Sewing Machine Co. Ltd., sewing machine manufacturers, at 13 Wharf Street. With very grateful thanks to Cameron Warner for sharing this personal story.